Here is a photo I took last week from over on Lost in America looking at the affected area of the October 2017 rockfall on ZM. 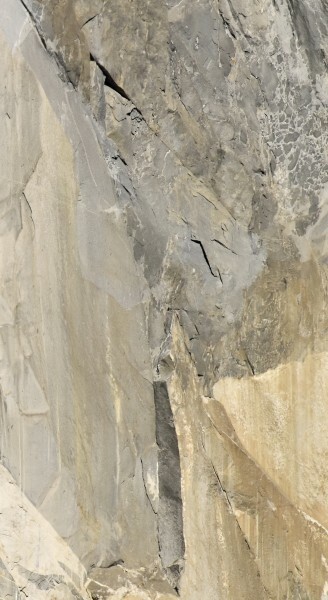 The red arrow indicates the belay stance at the start of p5 (top of p4). 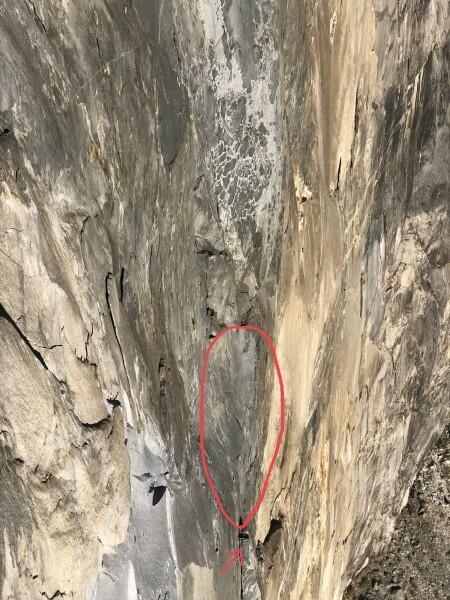 The red circle indicates the fresh rock scar area, hard to tell exactly but from this angle and distance but it looks to extend about 50-60 ft above the p5 belay. This is consistent with what we witnessed fall off which appeared to be a pillar of stone about 50’ tall just crumble and fall off. In the foreground on the bottom left/center you can see an even more recent rock scar that seems to have fallen off near p3 or 4 of Kaos. This is huge, and the debris is clearly seen at the base of the wall right as you exit the trees on the approach toward ZM/Zodiac. Shortest Straw seems to be unaffected. Tom Evans photo from way out west. We witnessed it from Zodiac and Tom and Greg Stock confirms with photos. I bailed off pitch 3 just a few days prior when I woke up with a rock bouncing off the ledge and a pile of sand in my face. Heads up! Active Rockfall! Pitch 5 is no longer there! On 10/16/17 we witnessed most of Pitch 5 from the Ledge at the belay and above depart from the cliff at 4:30pm from Zodiac. Getting stoked for my upcoming season brought me to this page. I was suprised to find all the criticism Mark received for cleaning the route and advising that people try to hold to a higher standard while climbing it in the future. Cmon people! Stop getting butthurt when people acknowledge and encourage the progression of our sport. We are all accountable for our actions while climbing. Why not hold ourselves to a higher standard? Its way more bitchin that way anyways. Carry on Mark, you rock. Offset cams have been around for more than 10 years haven't they? I take your point, but bringing this problem into present day awareness is more my goal. Look at my photos and tell me that the person placing those were valid head placements? Right next to an A1 cam? To hell with the cam, they could have placed a pin there! Can you honestly say that the heads in question were placed at a point in time when offset Master cams were available? Or that they had tried to place a sawed angle only to find that doing so would result in a beat out or bottomed out scar? What's obvious is that the tools we use to climb these wall routes have changed the way we solve these placement problems. But there's no real way to know how old some of that fixed gear is. Sometimes you can tell how new a head is but once its been there for a season its hard now where or not its 10 years old or dates back to the first ascent. I appreciate you bringing this to the attention of everyone in this community and the work you did on the route. There's no doubt that your service will result in a better experience for those that follow. But be fore warned that the vast majority of the elcap trade routes suffer from having been exposed to multiple generations of climbing technology. And not all that travel these walls have been as well equipped or experienced as you, cause if you don't keep this in mind your in for some serious frustration. My statement was that Copperheads are the first resort of the incompetent, I did not ever say that heads were a tool of the incompetent. Neither Bridwell nor any TR guy reached for a head unless he had thought the process through and decided that it was the best tool for the job. Sure. But that's not what you said, is it? My point is is that the Bridwell and the TR guys are looking at the placement and analyzing it and deciding which placement is the correct one. They have the knowledge, the experience and the spirit to keep the challenge up rather than beat a head into an A1 crack. After a dozen people beat heads into A1 cracks, the route is a copperhead clip up. Who wants to do that? Aren't we all for raising our game rather than degrading the route? I have two sets of offset cams and two sets of regular cams, seems like the standard wall rack to me. And I challenge you to name the person who has soloed El Cap in his 56th year. Believe me, I ain't no great aid climber and I don't think either route I've soloed is any too hard or impressive, yes, there are far harder routes and far better climbers soloing them. I never made that claim. My point was the power and finality of your statement. There are times and places where a particular piece of gear is absolutely the right thing to do. I have personally employed heads when there were no reasonably deep pin placements available and tiny cams didn't exist. Beaks didn't exist either. That's what your beta should reflect, rather than calling heads a tool of the incompetent. Not every one has 4 sets off offsets and 5 of each size beack. Not everyone is a wealthy american with a disposable income to hire porters. Not everyone has the internet to read all of the current spray regarding how other people think you should climb a given route. Give all of your spray a rest, your nothing special. Plenty of hard dudes out there soloing harder sh#t, I know a guy whos 56 who soloed El Cap so you aint setting any records either. Glad you had fun though! Keep that part goin strong! You should go up there and see where copperheads are now being placed. Obviously, Bridwell was not placing those heads, and I'm sure he would also be disgusted to see where they are being used these days. Do you think Bridwell would have placed a copperhead here? No, I'm not disparaging Bridwell or anyone on the FA of Tribal Rite in any shape, form or manner. Those guys knew the appropriate place for heads. It's the climbers who've come since that seem to think that a head is the first solution to a placement problem. When you go up there and are thinking of placing a head, think "copperheads are the first resort of the incompetent". I soloed this route over 7 days (with one pitch fixed) in early June. On the first four pitches I removed 20 useless copperheads, many of them were within inches of good and bomber nut, cam, hook and hand placed beak placements. Both of my butterknives broke so I was unable to clean out more heads further up the route. Luckily, the first four pitches seemed to be the worse as there were probably only 15 or so heads I'd have liked to clean out on the rest of the route. I jerked out three useless bolts and added a 3/8" bolt at the p8 belay, off to the right, to make the anchor better suited for portaledges. I cut off all of the tat I did not use on the route, probably 95% of all that I came across. I would revise the ST rack to include no pitons at all, but 4 of each size Beak. I hammered only beaks in the entire route, less than 20 times total. I placed no heads but take two of each size just in case. Offset Cams as well as small and medium offset nuts are the ticket. I didn't find any of the rivits "bad" they all seemed solid, they just stick out a long way. 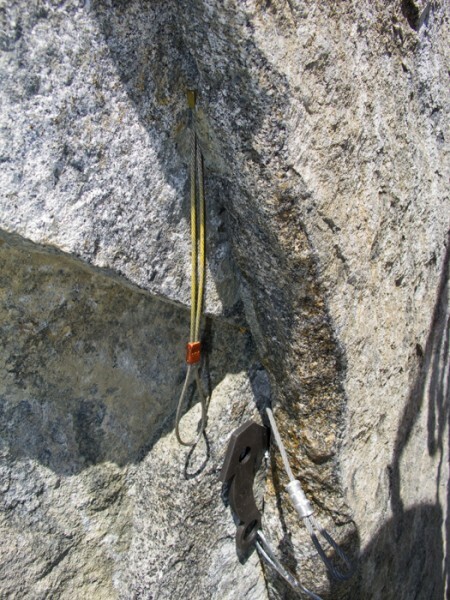 A large Pika hook should be standard equipment for this route. When you go up there and are thinking of placing a head, think "copperheads are the first resort of the incompetent". More often than not, you'll be able to climb past with out using one. You'll be happy you did. "Do everyone a favor by not inserting a head in a hook hole"
A "butterknife" or similar tool may be useful in removing deadheads. A punch is not quite the right tool. B.A.T. hooks bypass the couple of spots where placements are blown out. Do everyone a favor by not inserting a head in a hook hole. Fixed heads overall look good, but exceptions exist in a several spots. Pointed Cliffhangers and Grappling hooks are useful. B.A.T. hooks also. Many drilled and modified hook placements exist. Rivets are mostly machine heads which stick out much too far (3/4"). These can be optimized for pro by cinching a tie-off or small cordage on the shaft to keep the hanger against the rock. Bring a 1/4" bolt kit and some Rawl buttonheads with washers in case a rivet fails. P5 start: Stay left near the belay rather than further right where looser rock is. Pitch 10 end: Hook left out of head seam then up to belay. Heads there lead straight up and off route. Beware of loose rock--lost of it up there. Belays are bomber--thank you, ASCA. The ST rack seems pretty right on, but probably 8 LAs (mostly 2-3) and 4 KBs (mostly long) is sufficient. Maybe an extra beak or two. I don't seem to recall too much difficulty along any part of P10. If I remember correctly there are some drilled hooks traversing left to the P10 anchors, but certainly nothing out of character for this route. We topped out Oct 1, '05. There is already a millon bat hooks on the route! Has anyone fixed this yet? I still remember lots of cursing at this spot. The expanding flake going to the 10th pitch fell off. It's possible to use natural hooks but leaves you about twelve inches shy of clipping a bolt right below the anchor. I'm planning on asking Bridwell what he thinks should happen but I think a rivet there is inevitable. Bring a drill kit or prepare to use a cheater stick. Great route!!! Sustained but nothing to terribly difficult. The only further addition that I would make to the supertopo is the optional belay at the top of pitch 12. The topo says to skip the first belay then go up 20 feet. This is a bad idea because you will have to camp on a slab. 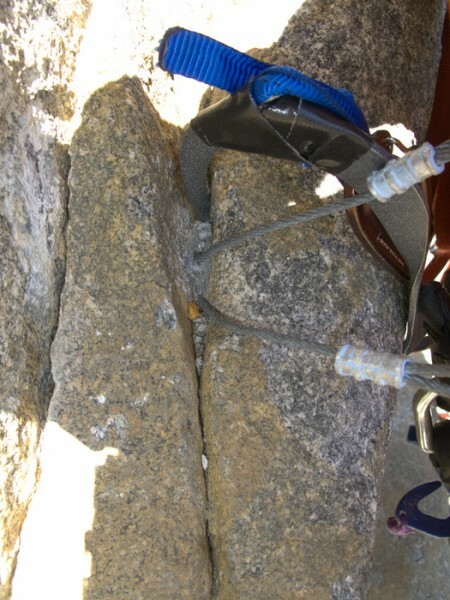 The optional belay has been rebolted and accomodates 2 portaledges. and focused on making a hammerless ascent. No special gear or trickery was required during the ascent. The pair made extensive use of cam hooks, small nuts and hooks. 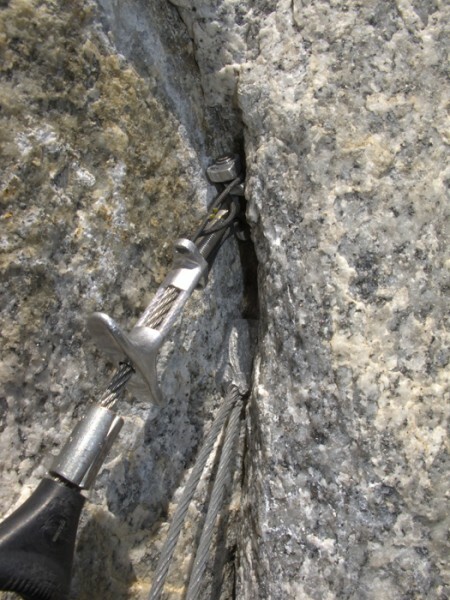 The crux pitch came on 15 which involved hand-placed blades above a string of micro nuts. Braden took two 30-footers on pitches one and two. For future hammerless ascents, Braden recommends two sets of cam hooks and praying that all the fixed heads hold. When Peter made the first ascent in 1981 he had just turned 19. Braden climbed the route two weeks before his 19th birthday. Upon arriving in the valley, I decided to solo Z.M. but I happened into a partner, while halfway through the first pitch. This being my first grade VI, I accepted. We used the Supertopos almost exclusively. I was as fascinated with the new topo as I was with my first exposure to hybrid aliens. The Z.M. topo is pretty excellent. I recall a few minor inconsistincies, with location and number of rivets on only a few picthes... it was an excellent route! 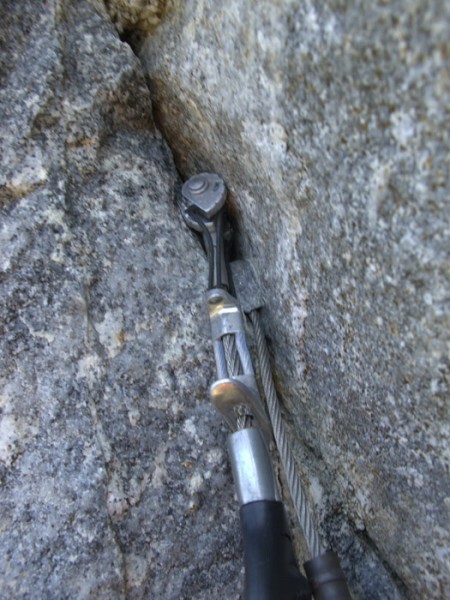 pitch 3 - has one bolt, the second bolt (shown on the topo)was not there. There is also a variation on this pitch that is not marked, that could be useful (I believe called "Right Ventricle", by Chris Kerrick and Bryan Law June 98') The variation goes more straight up off the belay, then left, where as the original line goes more left off the belay, then straight up. pitch 4 - The topo depicts a left leaning corner / roof system that extends from the "C2+", down to just atop the A3. The hatch marks are on the wrong side. This should be a left leaning corner / ramp system. My partner did all his pitches clean. I nailed a total of 5 times for pitches 1, 3, and 12. I also nailed 7 heads on pitch 10, the crux pitch. So 12 hammered placements for the route.